That chapter was a semester-long internship handpicked for Walker based on his career ambition to become a city manager. The Willie L. Brown, Jr. Fellowship connects talented, public-service-interested individuals like Walker — specifically, students who face barriers to opportunity — with public-sector internships, a $3,000 stipend and a support system to guide them. Walker, a finance major who graduated this spring with a GPA just shy of 4.0, came to SF State through Project Rebound, a program that helps ex-offenders succeed on campus — he served three years in prison. He is one of 52 Willie Brown Fellows who have been placed in city and county government internships around the Bay Area, according to Raquel Pinderhughes, the fellowship director and a professor in Urban Studies and Planning in the School of Public Affairs & Civic Engagement, where the fellowship program is housed. 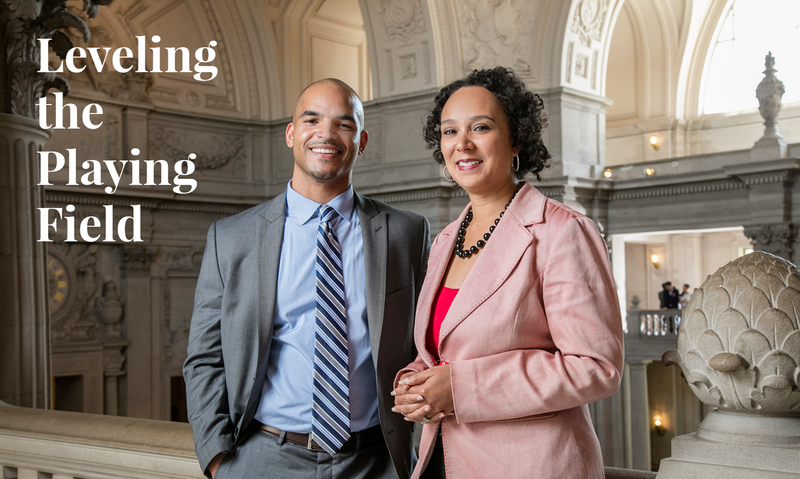 Walker is her office’s first Willie Brown Fellow. She ticks off some of the disjointed to-do list they exposed him to: measuring performance for animal care and control; developing policy to address the out-migration of African-Americans; evaluating software that measures the efficiency of the city’s fleets; working with different divisions on their budgets. “The array of topics he was able to touch on is kind of exciting,” she says. Walking through the building’s Doric-column-lined corridors, Walker anticipated a weighty-sounding topic for his main project, so he was surprised to find that his work would focus on puppies and kittens. He soon learned that city management involves all facets of urban life — even ones with cute, furry faces. Working under Kelly’s budget and planning director Adam Nguyen, Walker analyzed a proposed change to the city’s animal vaccination schedule. Nguyen says doing analyst work has enormous value for a future manager. “How many times do we vaccinate, what are the best practices, what are other municipalities doing around this? Then doing a cost-benefit analysis… and what are the tradeoffs and considerations along the way?” Gathering and assessing such facts yourself, he says, helps you to determine whether the information others present to you “is valid—if they’ve asked the right questions, if they have the information they need” to inform policy and operations-management decisions. Nguyen also taught Walker that strong teamwork skills can make government more efficient. “Every step he showed me, ‘Now look, if you do this, you’re making it easier for the next person who has to pick this up and make something happen with this project,’” Walker recalls. In addition to his project, he shadowed Kelly and others to a range of meetings, from listening to the mayor and department heads wrestle with public policy issues to reviewing purchase orders with division-based analysts. The internship, including the most challenging parts, strengthened Walker’s resolve to become a city manager. Based on the program’s success rate, his odds look good. All former fellows are either employed, applying to graduate or law school, or in a postgraduate program, Pinderhughes says. Something else the Willie Brown Fellows have in common is access to opportunities they wouldn’t ordinarily come by, including a network of influential people rooting for them to succeed. Supporters are dedicated because of their respect and affection for Willie Brown — and equally, Pinderhughes says, a deep belief in the program’s mission. “They are truly committed to the shared goal of getting people from diverse communities into positions of decision-making and power so that we can have representative government and services,” she says. Naomi Kelly thinks cultivating such opportunity is just good governance. “The more diverse opinions you have around the table, the better your policy will be,” she says. “You need to have multiple insights into cultural differences. Lead photo: Jared Walker, a Willie L. Brown, Jr. Fellow, joins San Francisco City Administrator Naomi Kelley beneath the dome of San Francisco City Hall.